Please note, for orders of 10 or more of the same item, please contact us directly for our attractive volume discount pricing. Value Added 30 minutes of FREE Coaching/ Consulting Call via Skype or Telephone Call with Charles. $125 additional Value to you. 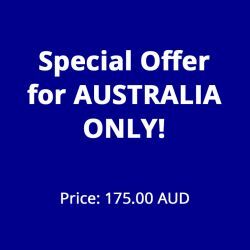 Total package price including products, inclusive of shipping to Australia , taxes and value added call. ONLY $175.00 AUD TOTAL COST - USE THE PAYPAL BUTTON BELOW TO COMPLETE YOUR PURCHASE!